1. Acknowledges that human induced change to the climate is occurring and will continue occur unless actions are taken to reduce greenhouse gas emissions in Australia and globally. 2. Supports Australian contributions to keep global temperatures to less than 2°C above preindustrial levels. 3. Acknowledges that a significant proportion of Australia’s coal reserves will have to remain unburned if the world is to avoid further dangerous global warming. 4. Carefully review the Climate Change Authority Review on Caps and Targets, ensuring recommendations are evidence-based and that all information from this report is made publicly available. 5. Ensure any tabled Emissions Trading Scheme (ETS) legislation addresses the criticisms of the EU ETS system, particularly the transparency with which permits are allocated to industry, the impact on food production, and the openness of industry reporting on measured emissions. 6. Combat secrecy and corruption in the relationship between governments and fossil carbon industries, and support measures for the federal government to limit subsidies to coal terminal leases, coal transport-infrastructure expenditures, and diesel tax rebates for coal producing activities in Australia. 7. Support legislative measures to encourage the development of renewable energy, including the Mandatory Renewables Energy Target, the Clean Energy Finance Corporation and mechanisms to better allow the grid-integration of renewable energy sources. 8. Ensure the change from coal based industries is done responsibly with concern for communities directly involved in coal production. 9. Support research and development into climate science and innovative, scientifically and ecologically sound, technological and social responses to climate and energy change. 10. Support measures to increase the resilience and adaptability of climate-exposed industries including agriculture, forestry, fisheries, tourism, transport and essential services, to climate change and the increasing frequency of extreme weather events. 1. The WikiLeaks Party (WLP) acknowledges that human induced change to the climate is occurring and will continue to occur unless actions are taken immediately to reduce greenhouse gas emissions in Australia and globally . 2. Australia is a dry continent subject to the vagaries of national climate. It is a country particularly reliant on climate sensitive sectors such as agriculture, fisheries and tourism. Our lifestyle and economy are dependent on coastal resources, all of which are directly affected by changes in climate. The WikiLeaks Party supports Australia contributing to global action to keep the Earth’s temperature to less than 2 degrees Celsius above preindustrial levels in order to prevent further dangerous human-caused interference with the climate. 3. The WikiLeaks Party understands that CO2 now exceeds 400 parts per million in the atmosphere and that continued emissions will cause further warming of the planet, the science of which is succinctly expressed in the three numbers of Bill McKibben, Fellow of the American Academy of Arts and Sciences. These three numbers are: i) 2 degrees – the limit of warming to which governments have agreed; ii) 565 gigatonnes of CO2 – the amount of CO2 we can emit into the atmosphere to stay under 2 degrees; and iii) 2795 gigatonnes of CO2 – the amount of CO2 that would be emitted if we burned the known fossil fuel reserves of the planet. Following the recent report of the Australian Climate Commission , we acknowledge that a significant proportion of Australia’s coal reserves will have to be left unburned (in Australia or elsewhere) if the world is to avoid catastrophic global warming. Doing this cooperatively in the global community whilst maintaining a robust Australian economy is a significant policy challenge: the WLP acknowledges that climate change is an international and intergenerational tragedy of the commons and prisoners’ dilemma wrapped in one. 4. The WikiLeaks Party in the Senate will carefully review the Climate Change Authority Review on Caps and Targets, due by the 28th February 2014, ensuring that all information is publicly available, and that the independent scientific evidence underpinning the review supports the government’s actions. 5. 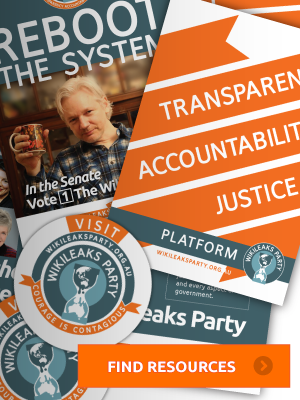 The WikiLeaks Party will ensure any tabled legislation addresses the criticisms of the European Union (EU) Emissions Trading Scheme (ETS), particularly the transparency with which permits are allocated to industry, the impact on food production, and the openness of industry reporting on measured emissions. 6. The WikiLeaks Party will combat secrecy and corruption in the relationship between the government and polluting industries. The WLP further supports natural, undistorted market based solutions to climate change, and to this end encourages measures for the federal government to i) limit the direct subsidies to coal terminal leases and the provision of infrastructure for coal transport; ii) forego the diesel tax rebate for coal mining in Australia; and iii) lower coal subsidies and trade barriers that act as distortions to the market. 7. The WikiLeaks Party acknowledges South Australia’s early achievement of the Mandatory Renewables Energy Target (MRET) and in light of Bloomberg Finance’s analysis that new wind and solar power plants are cheaper to build than new coal and gas power plants, encourages the increased supply of renewable energy in Australia. The WLP will support the MRET, the Clean Energy Finance Corporation, and measures that better allow the grid-integration of renewable energy supply into the National Electricity Market. 8. The WikiLeaks Party acknowledges that coal currently contributes ~2% of our GDP and generates 68% of Australian electricity. We are the world’s second largest exporter of coal, the production of coal in the Hunter employs 6% of the local population, royalties contribute $3 billion to the QLD government and $1.3 billion to the NSW government annually, and we have 9% of the world’s known coal reserves. The WLP acknowledges any change to this industry will be difficult and must be done responsibly and compassionately. However, the WLP also understands that the consequences of >2 degrees warming are catastrophic and include: longer and more severe droughts, increased frequency of extreme weather events with associated insurance costs, more intense bushfires, bleaching of the Great Barrier Reef, rapid shifting of viable farming locations and loss of biodiversity amongst others. 9. The WikiLeaks Party supports research and development into climate science, renewable energy, carbon-sequestration, electricity-grid transformation and the feasibility of pricing the extraction of carbon from the earth’s crust instead of the emission of CO2 into its atmosphere. The WLP further supports research into the economic and social consequences of changing climate, and innovative, scientifically and ecologically sound responses to climate change in Australia. 10. 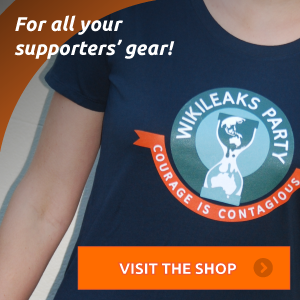 The WikiLeaks Party supports measures to increase the resilience and adaptability of all climate exposed industries in Australia, including but not limited to: agriculture, forestry, fisheries, tourism, transport, and essential services, in the face of climate change and the increasing frequency of extreme weather events.